If losing a tooth has made your smile less than perfect, causing you to hide in social situations, there is a way that you can regain your confidence and smile once again. You can fill in the gap of a missing tooth with a dental implant. Not sure if a dental implant is for you? To help, we’ve compiled the questions that we heard most often from patients to help you decide if they are right for you. A: Dental implants are actually the device that holds a cap or crown in place. It is devised like a screw that is made out of a strong titanium with a threaded end. This allows the dental implant to be gently placed within the gap of your missing tooth, acting as the root of your tooth. Next, a cap or crown is added to replace the tooth that was missing, improving your smile from end-to-end. Q: Do I Need Dental Implants? A: Dental implants are a treatment available in Singapore to replace missing teeth. Whether it is one tooth or a series of teeth, dental implants can replace the teeth you are missing with a natural-looking tooth replacement. While appearance is the main reason that patients choose to have a dental implant, others find that it makes it easier for them to eat as well. Missing teeth can make it uncomfortable and difficult to chew hard or solid foods. With a dental implant, you get a huge improvement on both aesthetics and functionality – you have a beautiful smile once again while gaining back the ability to eat more comfortably and easily. Q: Do Dental Implants Look Natural? A: Dental implants are different than a crown or cap. They are the device that secures your cap or crown in place and are completely undetectable when inserted by an experienced cosmetic dental professional. Once your dental implant is placed, and the site has had time to heal, your crown or cap will be added, giving you that natural smile you have been looking for. A: You will actually have your dental implant for many years if you take proper care of it. Dental implants are designed to last for 40 years or more with proper brushing and flossing. It is also recommended that you have regular cleaning with your regular aesthetic dental clinic in Singapore, preferably the same clinic that did your implant, to maintain your oral health. Many people that have good dental hygiene find that their dental implants last a lifetime just because they took the time and effort to make sure they were cared for. 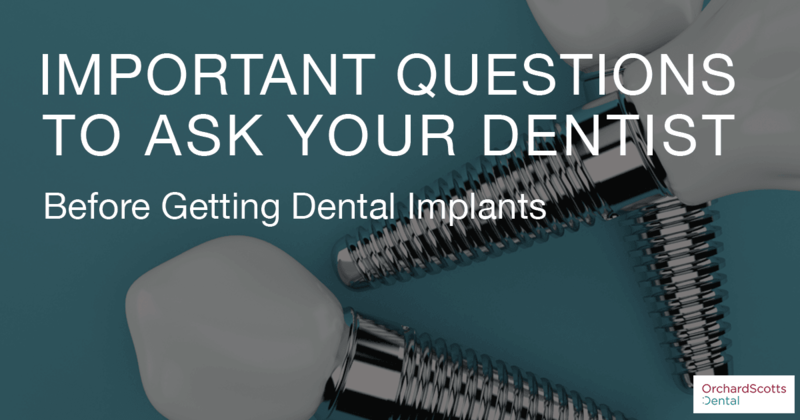 Q: Does It Hurt To Get Dental Implants? A: There is slight discomfort during the insertion of a dental implant. Most people are able to overcome this small amount of pain with over-the-counter medications. The soreness typically only lasts for two to five days after your dental implant surgery. There is a chance that your dental implant may require a bone graft. In these instances, your dentist may prescribe pain medications to help with the added discomfort you are experiencing. Q: How Long Does Dental Implant Surgery Take? A: Your dental implant surgery may range from 30 minutes to three or four hours, depending on the number of dental implants that you are having. An experienced dental clinic will provide you with the estimated amount of time that your dental surgery will take when you book your appointment. This can help you prepare for your surgery, which will also include a follow-up appointment after the dental implant site has healed. Your crown or cap will then be added to your dental implant during your follow up appointment. Q: Are Dental Implants Safe? A: A dental implant is safe for anyone that is healthy enough to undergo surgery. They offer a longer-lasting alternative to have a bridge or dentures and will provide you with that smile makeover you are looking to achieve. Your dental clinic will determine if you are a good candidate for dental implants and guide you through the surgery process. A: Dental implants in Singapore are a costly endeavour, but you need to bear in mind that they do last a lifetime with the proper care. Your expenses for dental implants include surgical costs as well as the price of a dental implant and crown or cap. It is well worth the investment to have dental implants as they are more comfortable long-term and do not cause bone loss or nerve damage. Q: Can Any Dental Clinic Perform A Dental Implant? A: It is imperative that you find a knowledgeable and experienced dental clinic in Singapore to perform your dental implant surgery. They should be experts in the field of dental implants with proper training and use the best tools and technologies available such as Straumann implants. You may be tempted to have dental implant surgery to improve your smile from clinics promising unbelievably low prices that sound too good to be true, but this is not the quality you want. You need to focus on the training and experience of your cosmetic dental professional as well as the system and brand of the dental implants used. If you don’t, there could be complications with your surgery that they are not prepared to handle. This could cause you significant health issues with your teeth. Always choose a cosmetic dental professional that is experienced with dental implants with the necessary training to back it up. When you are looking to improve your smile with dental implants, contact Orchard Scotts Dental. We can give you a smile makeover that will make you show your teeth once again. Contact us today to see if dental implants can provide you with the smile you have always dreamed of.